a passionate commitment to Jewish life, learning, community and spiritual growth. 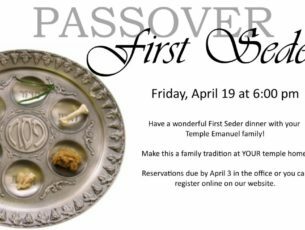 Have a wonderful First Seder dinner with your Temple Emanuel family! Make this a family tradition at YOUR temple home. Reservations due by April 3. Click here to reserve your seats! Never Again. We have the courage to remember the Holocaust and honor the past to shape the future of our community with a candle lighting and dedication. 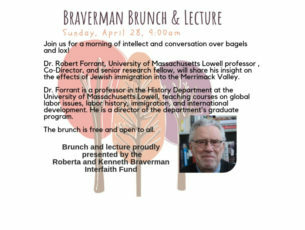 Richard Cohen, President of the Southern Poverty Law Center, will share his words of wisdom. Meet with other moms to talk, share stories and ideas and have fun with your little one (ages u p to 18 months). Meets every Friday through May 31. Contact Cindy to register. Never Again. We have the courage to remember the Holocaust and honor the past to shape the future of our community with a candle lighting and dedication. 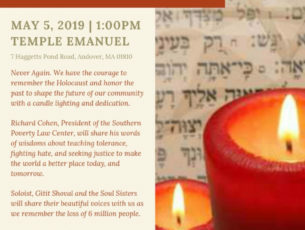 Richard Cohen, President of the Southern Poverty Law Center, will share his words of wisdom about teaching tolerance, fighting hate, and seeking justice to make the world a better place today, and tomorrow. Soloist, Gitit Shoval and the Soul Sisters will share their beautiful voices with us as we remember the loss of 6 million people. 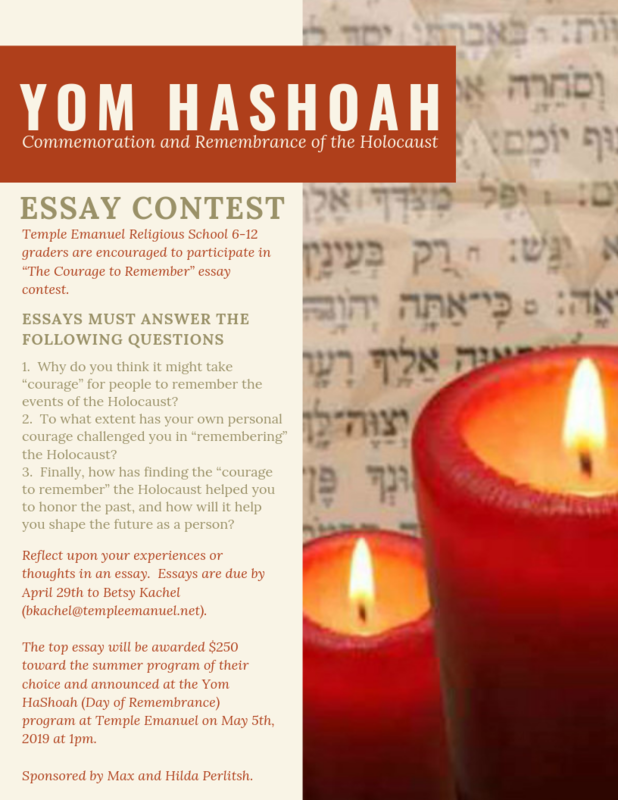 Click here for information on the Essay Contest. For a complete list of our upcoming events, please visit our calendar. 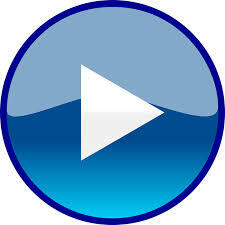 Live streaming of services at Temple Emanuel is now available! Streaming and archives for Sanctuary and Chapel services – including all of the High Holy Day Services – can be found by clicking here. Click here for our Religious School Calendar. Click here for our Preschool Calendar. A Rabbi, A Priest, And A Minister Walk Into A Studio. 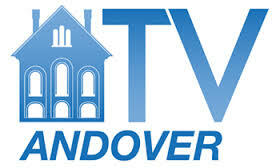 Watch the latest episode of this local Andover television show featuring our Rabbi, Robert Goldstein, along with Rev. Michael Hodges of Christ Church and Rev. Dana Allen Walsh of South Church. To David (Susan) Holzman and Family on the passing of his beloved father, Louis Sumner Holzman. To Kevin (Ellen) Keller and Family on the passing of his beloved brother, Robert Keller. To Jessica and Joe Miller and Family on the passing of her beloved mother, Deena Ruth Gonick, beloved mother and grandmother. To Marcy and Jon Samel and Family on the passing of her beloved mother Ariadne Barbara Alter Lydon (“Nan”). Our condolences to Kevin (Ellen) Keller and Family on the passing of his beloved sister Jackie Keller DeFauw. Funeral and all arrangements to take place in Ohio. May Jackie’s memory be a blessing to all. May their memory be a blessing to all.